Spicy, sweet, and oh, so seasonal! The only way to make this meal more representative of Autumn would be to make it in the pumpkin patch! There’s something so deceivingly decadent about this velvety soup featuring pumpkin, Ambrosia apples, coconut milk and hint of cayenne and ginger for extra zip. It’s a perfect combination with the Ambrosia bringing in a little bit of sweet, the spices adding the heat, and the pumpkin delivering some cozy comfort. You can peel your Ambrosia apples but you don’t need to. We just core and chop them. This soup works well with almost any kind of squash – you could try it with pumpkin, acorn, butternut, red curry, blue Hubbard or kabocha. Experimenting is so much fun. 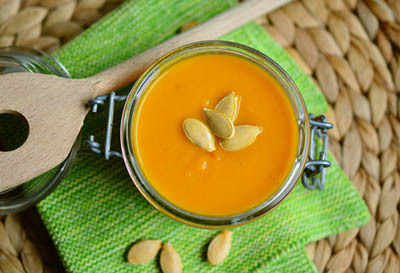 The soup you see in the picture is made with Kabocha and we just love the colour. If you haven’t cooked with pumpkin or squashes before, here’s a tip. Put it in the oven for a few minutes and it will be a lot easier to cut and peel. Just don’t leave it in too long and overcook it! The magic of this soup happens when you are sautéing the main ingredients before adding the liquid. To do it right, you will caramelize the onion, pumpkin and Ambrosia, locking in all of the spicy flavour. Add onion, pumpkin, Ambrosia apples, ginger, garlic, and spices. Sauté until onions begin to caramelize. It’s okay if they burn a little bit but if they start to stick to the bottom, add a splash of water. Once caramelized, add water. Everything should be submerged. If it’s not, add a bit more water. Bring to a boil then reduce to simmer until pumpkin pieces are falling-apart soft. Remove from heat and allow to cool a little bit. Transfer to a blender or use an immersion blender in the pot. Blend until consistency is velvety smooth. Add coconut milk and blend again. Garnish bowls of soup with roasted pumpkin seeds and a drizzle of coconut milk. This soup is filling and could easily be a hearty meal when served with a hunk of fresh harvest bread. And here’s a bonus – we have no idea why this is true – it seems to taste even better the next day, hot or cold. Let us know how it turned out for you and which style of pumpkin you used.